The U.S. Supreme Court Wednesday will hear an appeal from death row inmate Duane Buck, whose trial included racially discriminatory testimony. 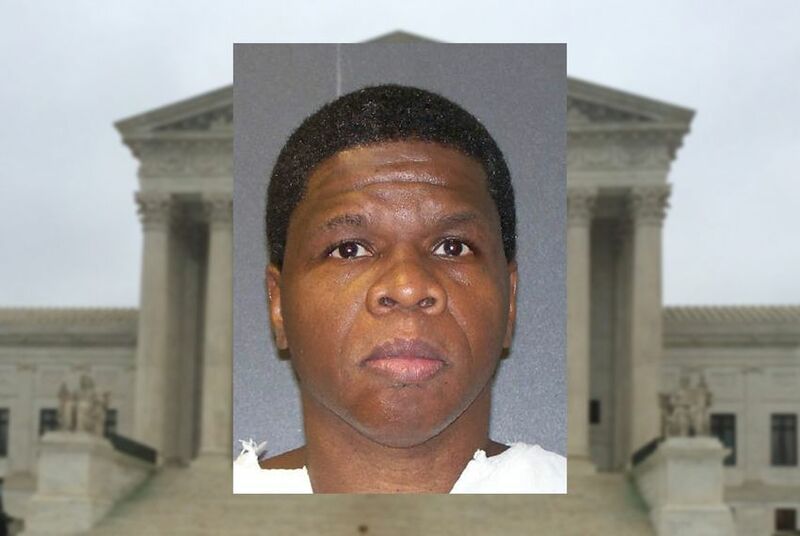 Attorneys for Texas death row inmate Duane Buck — a black man whose sentencing trial included testimony claiming he was more likely to be a future danger because of his race — will try to convince the U.S. Supreme Court Wednesday to order lower courts to reconsider the impact of the racially charged testimony. There's no disagreement that Buck, now 53, gunned down two people, including his ex-girlfriend, more than 20 years ago. To sentence Buck to death, his jury had to agree unanimously that he presented a future danger. It did, and Buck argues that happened in part because his own defense attorneys improperly presented testimony that blacks are statistically more prone to violence. Inadequate appeals and the complexities of death penalty appellate law have prevented Buck from fully pressing the point, his attorneys will argue before the eight sitting justices of the nation's high court. Buck’s ultimate goal is to be granted a new, “color-blind” sentencing trial, according to his attorneys. Texas will argue that the lower courts have rightly declined to review the claim, and that Buck can't substantially show that excluding the testimony would have led to a different sentence, according to the state’s brief to the high court. The Attorney General's Office, which will argue for the state of Texas, did not comment for this story. In the early morning of July 30, 1995, Buck broke into the Houston home of his ex-girlfriend, Debra Gardner, fatally shooting her and Kenneth Butler, who he accused of sleeping with Gardner, court documents show. Buck also shot his stepsister in the chest, but she survived. Buck’s attorneys don’t deny the atrocity of the crime, but argue that he was denied a fair trial because of testimony by psychologist Walter Quijano. Quijano testified in the sentencing phase of the trial that Buck was more likely to be a future danger because he is black. Oddly, it was Buck's defense lawyer who called Quijano and elicited the testimony. Both the state of Texas and Buck's lawyers agree that racial testimony had no place in the trial, but they differ on what impact the testimony had, and whether it justifies throwing out his death sentence. Buck’s early appeals did not mention the racial testimony, or his counsel’s ineffectiveness for introducing it. In early 2000, then-Attorney General John Cornyn agreed that similar testimony by Quijano in a separate death row case had violated that inmate's constitutional rights. Buck's lawyers later began raising the question of Quijano's testimony, but those appeals were unsuccessful. Courts ruled that Buck had waited too long to raise the issue, and that Buck’s case differed from other cases involving Quijano because it was the defense that evoked the racial testimony, not the state. If the high court agrees, it could order lower courts to reconsider whether Buck might have escaped a death sentence absent the racial testimony, or it could simply order a new sentencing hearing. If the court sides with Texas, Buck’s appeals are likely over and he could be eligible for a new execution date. Several unrelated groups have filed briefs with the Supreme Court supporting Buck's appeal, including a collection of former prosecutors and attorney generals calling for a new sentencing hearing. One of the prosecutors in Buck's original trial has signed onto the brief. Either way, the case isn’t likely to set a landmark precedent for future cases in Texas or throughout the nation, Steiker said. More than 100 elected officials, religious officials and lawyers sent a letter to the Harris County district attorney's office urging a new hearing in the case of Duane Buck, who they say was unfairly sentenced to death because of an expert witness's testimony.